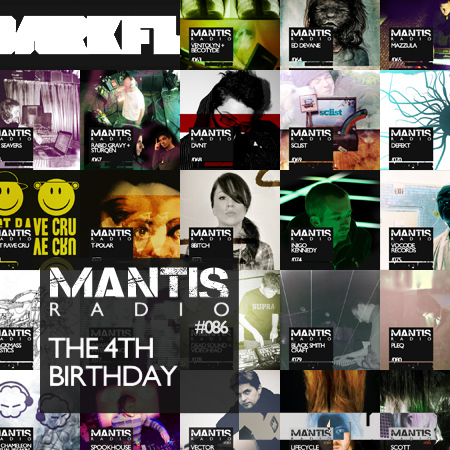 It’s our 4th Mantis Radio Anniversary Special, as is our tradition, this week we take a look back at the last year, including a rundown of the 3 most popular sessions from the 12 months. Yes, we’ve reached that milestone, in fact we very nearly overshot it. As old as we’re getting now we nearly forgot it was our birthday. As we enter the 5th year of broadcasting the show, we celebrate with a retrospective look at the past years 22 broadcasts, including a run down and 20 minute excerpt from the top 3, most downloaded shows in the past year. It’s been very close on the old statistics front with not very many separating them. I’ll also be rinsing through some of many tracks I’ve played over the past year, picking out some of my faves. It is perhaps worth me mentioning that I try to deliver fresh music to each show, so very easily I misplace and genuinely forgot some of the quite awesome sound dropped over the past years archived broadcasts. All the shows (and the earlier 62 shows) are still available and will remain so. Which show was your favourite? Did you discover a great new producer from the show? If so, who? Let us know, I’d be very interested in who perked your interest. As I say every year, a huge thank you to both the showcased guests and you the listeners. Thank you for your continued support. Here’s to another year!